Siga os passos de mestre impressionista Claude Monet com esse traslado de ida privado de Paris a Giverny em veículo de luxo. Na chegada, você terá quatro horas para explorar a vila de Giverny, onde o lendário artista viveu de 1883 a 1926; a excursão casa de Monet, studio e jardins (taxas de entrada não incluídas); ou visite seu túmulo. Incredibly disappointed with this tour and couldn't recommend. Tour states 4 hours at Giverny but this isn't correct the 4 hours includes the car trip which takes up 2 hours. Had 2 hours left of which we had to line up for 45 minutes to get in that left a total of 1 hour 15 minutes for the gardens and house had to rush through and the driver was messaging us that he had to leave. Tour also clearly states that we have a driver/guide.. what a joke he didn't even introduce himself did not speak to us during the 1 hour drive, all he said when we arrived was be back here in 1 hour 45 minutes. Not worth the money we felt very ripped off we could have just gotten a bus and saved a fortune. Lovely!!! Not enough time to really see everything though. But what a nice and relaxing way to get to Giverny Garden. A very smooth and professional service. The booking of this day trip was easy, the follow up by Viator was timely and our driver was prompt and courteous. He was an excellent driver and the car was first rate. We had expected a little more commentary perhaps enroute to Giverny, but perhaps that was our mistaken expectation. 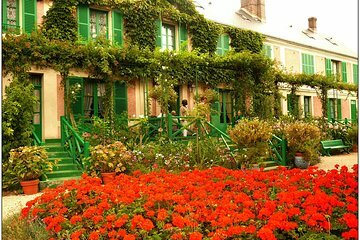 It was a pleasant and efficient way to get to Giverny to see the lovely gardens and walk in Monet's footsteps.